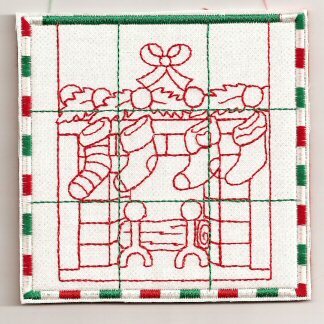 Christmas Tic Tac Toe includes instructions to add a felt pocket behind the tic tac toe game board. on felt and backed with cutaway to hide the stitches. Click on the graphic to see a larger view of the 5x7 board stitched with variegated thread. 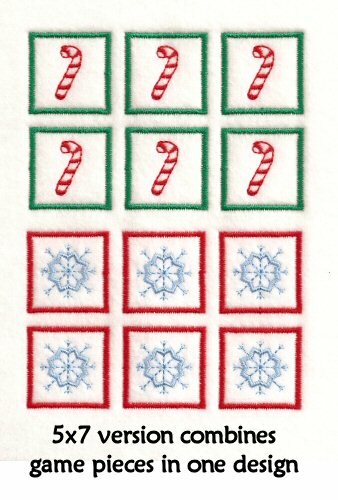 Click on the candy canes to see how the game pieces are combined in one file for 5x7 version. stitched as two separate files. Note sizes before you order. Select the format you require in the drop down menu with the Pay Pal button. Designs will be emailed to you as soon as possible. Use the link on the right to purchase 5x7 version with instructions for completing the in-the-hoop game board with felt pocket on the back. You will receive 2 files (board and game pieces) with instructions. Use the link on the right to purchase 4x4 version with instructions for completing the in-the-hoop game board with felt pocket on the back. You will receive 3 files (board, candy canes, snowflakes) with instructions. Stitch game pieces twice for two players. Click on the photos to download the designs. Read the instructions provided in the file to learn how to use the design as an in-the-hoop project to create a pencil topper. A matching Angel Pencil Topper design can also be found at this site.